A flat slab forming the uppermost member or division of the capital of a column. An abacus is sometimes called an impost or impost-block, but it is really an impost-block from which arches spring. Walking area around the chancel. Semi-circular or polygonal ending to the chancel. The apse can be further extended by apsidal chapels. Absidiole - French for a minor apse or 'apselet'. The plan of Saint-Sever abbey church (on left) has a central apse and six absidoles that form a complex, parallel and stepped system making up the chevet of Saint-Sever-sur-Adour Abbey church. An arch supports the stonework of a building above an opening such as a window or a door. • Roman and Romanesque arches are rounded, formed in a continuous curve, usually a semicircle. • Gothic arches are pointed, enabling them to support loads over varying spans. While arches are essentially two-dimensional supports for the superstructures above them, a vault can be regarded as a three-dimensional expression of such support. • A barrel vault is also known as a tunnel vault or a wagon vault. • A groin vault can be the intersection of two barrel vaults, see the pink areas in the diagrams below. The word "groin" refers to the 'crease' between intersecting barrel vaults. Roman architects determined that two barrel vaults intersecting at right angles formed a groin vault. However, the groin vault requires very precise shaping of the stone. This skill declined in the West as the Roman Empire ended. Groin vaults can also be found supported by four columns in extensive spaces such as crypts. In order to see how groin vaults relate to (probably earlier) barrel vaults, the illustrations just above have the same highlighting colours : pink for the vault (or its equivalent location) and green for one of the columns (or its equivalent location). • A horseshoe arch is similar to the arch of a barrel vault, but having the two springer stones are placed slightly closer together than the widest part of the arch being supported..
• A stilted arch is one where the curve of the arch begins above the impost line, standing on the springer. The arch is on stone stilts! When rounded Roman arches were used, they could well span different widths. However, being a semicircle, a wider Roman arch would be higher as well as wider. Thus stilts were used to maintain a uniform height, raising the smaller width and height arches to the same level as the larger ones. Sometimes, barrel vaults and their associated groin vaults have been constructed in conjunction with pointed Roman arches. • A particular arch is the diaphragm arch. Also known as flying screens, because the space between the arch and the surrounding walls and ceiling provide a solid screen with minimal support - it flies. The diaphragm arch has fire break properties, inhibiting sparks and flames that rise with heat from flowing between different areas of the building. Another name for the lintel above a doorway. The architrave or lintel supports the tympanum. A decorative moulding around and under an arch, on its under surface, which follows the extrados of an arch, forming an arch-like frame for an opening. A common, approximate term for a cathedral or church where the aisles and the nave are of similar height; for example, see Poitiers Cathedral. This is the name given to the lower thickening of a column or a pillar that provides the column's foundation and support. Note that an ancient Roman column had at its lower end a projection consisting of a a decorative, convex strip used for ornamentation or finishing and a scroll. With a few exceptions, mediæval columns have no lower projection or embellishment on its base. Thus, with the scroll and other decorations removed, monumental stone cutters were spared considerable work. As a result, the 'cornice' could be part of the capital instead of being rebated into the column. Although the words ‘bell’ and ‘belfry’ seem related, the bel- portion of belfry was not connected with bells until comparatively recently. Etymology: The word ‘belfry’ goes back to a prehistoric Common Germanic compound. The second part of the compound is the element *frij-, meaning “peace, safety”; while the first element is either *bergan, meaning “to protect”, giving a compound meaning of “a defensive place of shelter”, or *berg-, meaning “a high place”, and giving a compound meaning of “a high place of safety, a tower”. The Old French word derived from the Common Germanic compound is berfrei. First this meant “siege tower”, and later “watchtower”. Warning bells were used in these towers, thus the word was also applied to bell towers. In Old North French, berfrei mutated to belfroi. This, in turn, caused English speakers to think of the native Old English word belle (Modern English, bell), and in Middle English became belfry meaning “bell tower”. A bell wall is an architectural element, a vertical, flat wall at the top or front of a building, usually churches, built to to accommodate bells. On a church, the bell wall is placed as the west facade. Each of the sloping flyers splits in two (bifurcates), presenting a 'Y'-shape in a bird's-eye view. A bréteche is a small, rectangular, structure that juts out from the fortified building, overhanging an entrance way, so defenders can throw down, or let fall, projectiles onto approaching assailants. Named because the tower’s construction is said to have been paid for out of the dispensations granted to those who did not wish to fast during Lent. As part of the dispensation, these people were allowed to drink milk and eat butter. Butter towers are part of Rouen and Bourges cathedrals. Buttresses are stone bracings that prevent cathedral walls collapsing from lateral and vertical pressures. As well as the weight of the roofs and walls, pressure can come from winds pushing against these tall and bulky structures. Flying buttresses are stone ‘bars’ that apply a horizontal force inwards towards the cathedral wall. This force counter-acts the tendency of the walls to bulge out from the lateral pressures. The upper flying buttress redirects the wind forces from the roof and the clerestory wall, guiding them downwards into the pier buttress. The lower flying buttress performs the same duty, but for the outward lateral forces being exerted by the nave vaulting. The pier buttress blocks the equivalent force from the vaulting of the side aisle. The pier buttress also supports the flying buttresses, bracing them so the cathedral wall does not move outwards. The pier buttress also transforms the still sideways forces into downward ones. The pinnacle adds further weight to the pier buttress, helping to anchor it against sideways pressure. For much greater detail, see buttressing and chainage. Wretched and poor person belonging to a group banned for ill-defined reasons (originally, perhaps those affected by leprosy or other disease), once established in Pyrenean valleys of Béarn and in Gascony, as well as other parts of Western France and North Spain. The word was then applied derisively to bigots[(semantic evolution: leper > hypocrite > bigot]. Cagots were shunned, unable to mix socially or commercially, forced to form separate communities. They entered the church by a separate door, often deliberately made low so those entering had to bow as supposedly fit their lowly social station. Cagots were either banned from receiving communion or receiving it from the end of a long wooden spoon. Cagots were often only permitted to be a carpenter, butcher, or rope-maker. The top protruding stones of a column. The capital at the head of a column spreads the load to the structures above, providing the transition from column to lintel or arch (see below left). For thousands of years, the capital has been an excuse for all manner of artistic decoration. Originating in ancient Greece, different styles are named after the period when they were prevalent. Corinthian - With three superimposed rows of carved foliage (acanthus leaves) and small volutes (spiral scrolls) at the corners. Ionic - a Greek style with the major decorations being large volutes on either side. These capitals are not common in Gothic buildings. This is the part of the church to the east of the transept. The word choir is sometimes used sloppily for this area, but more sensibly just applied to the area where the choir sings. The chancel includes the high altar at its eastern end. A name used in France for the eastern end of the church in general, this we would call the apse. The chevet comprises an apse with radiating chapels beyond the aisle around the choir, the ambulatory. The resulting, more complicated structure became known as the chevet from the beginning of the 13th century. Individual shaped stones in an arch, other than the keystone. Also known as a voissoir. Also clerstory, clarestory, clerestorey, clarester, cleer story, clear story, clearstory. Clere must here have meant ‘light, lighted,’ since the sense ‘free, unobstructed’ did not yet exist. This assumed derivation is strengthened by the parallel blind-story, although this may have been a later formulation in imitation of clere-story. The great difficulty is the non-appearance of story in the sense required before c. 1600, and the absence of all trace of it in any sense in 14th, 15th, and chief part of 16th c. At the same time there is a solitary instance of story in the civic Rolls of Gloucester [R. Glouc.] (1724), which may mean ‘elevated structure’ or ‘fortified place’. The upper part of the nave, choir, and transepts of a cathedral or other large church, lying above the triforium (or, if there is no triforium, immediately over the arches of the nave, etc. ), and containing a series of windows, clear of the roofs of the aisles, admitting light to the central parts of the building. Clearstory is now more common in the USA, whereas European usage prefers clerestory. It is interesting to note that large numbers of the more useful monographs on the architecture of medieval France originate in the USA, while many of the more philosophical studies originate in the United Kingdom. A single, slim, vertical support with a cylindrical or a polygonal cross-section to its shaft (see on the right). A column always has a base and a capital. Because columns are of relatively small diameter, they are only capable of supporting vertical down force and unable to support much oblique load, like those generated by arches or vaulting. The carved version is called a modillon in French. On a vertical surface such as a wall, the highest horizontal area that juts or sticks out, such as mouldings along the top of a wall or just below a roof line. Walls with lower and higher parts that provide cover for defenders protecting a building. The cut-out, lower parts are called crenels. Found on fortified churches such as that at Beaumont-du-Périgord. A subterranean room or vault, especially one beneath the main floor of a church, used as a burial place or for, frequently secret, meetings. [Public architecture] The lower part of a wall; or the part of a pedestal between the base and the cornice. [Domestic architecture] The wall below the dado rail and above the skirting board. This word was originally written as de lit, but the two words have elided over time, acquiring an acute accent. De lit means 'out of bed', in this context not lying parallel to how the sedimentary strata were laid. In architecture, this term refers to the cutting and placing of a stone for construction. Délit contrasts with au lit, 'in the bed'. Traditionally, the stone is cut and laid down in accord with the geological strata of the quarry bed of which the rock is constituted, which strata are substantially horizontal. Laid this way, the stone resists the pressure of the loads that are exerted on it. In contrast, la pose en délit (posing or placing against the grain) consists in placing the stone so the strata (bed) are vertical. Placing en délit causes a risk of vertical cracking or disintegration. This is why it is prohibited (in France) when using "laminated" materials such as certain limestones and shales; vertical placing/en délit being more suitable for homogeneous materials. However, construction en délit was much used by the Romans, and later by the builders of the flamboyant Gothic cathedrals - for aesthetic reasons (the visual smoothness of the stone, achieving great heights without joints) and, in fact, as demonstrations of technical virtuosity. Although stone cut en délit is prone to shattering under compression, by cutting en délit, much longer pillars, tracery and other slender structures may be achieved. Compressive shattering can be mostly avoided by ensuring that the stone concerned is not significantly load-bearing. These two usages of délit are not etymologically related in any way. Délit, a minor crime, comes from the same root as delinquent and delinquency. Pattern created by repeating small, often geometrical, designs. Used to decorate walls, and as backgrounds in illuminated documents, such as books. Hemispherical covering or roof over a large space, in cathedrals and churches. Generally, a dome is placed at the crossing of the nave and transepts. A dome is an architectural achievement, as the circular base of the dome rests usually on four pillars having a square footprint. See Pedentives, squinches, drums, domes and lanterns for illustration and further discussion. Great tower or innermost keep (bailey) of a castle. Originally the word dungeon was used in this sense (see, for instance, Chaucer). Later, the word was changed from the sense of great tower to the modern usage of dungeon, while donjon is now used for the original sense. Supplementary cubical block or super-abacus, [super, Latin for over], which is often taller than the capital itself, placed over an abacus of Earl Christian, Byzantine, and Romanesque capitals. Where the nave and transepts of a cathedral cross, that crossing can be surmounted by a structure that straddles the four corner pillars of the crossing. A drum, an empty cylinder, is one such structure. A drum can be of short stature, or can have its height extended to become a lantern or a tower. Lanterns are pierced by windows that enable light to enter the cathedral from the exterior. An opening for a portal or window built into a thick wall. An embrasure often has angled sides, so that the opening is larger on the inside than the outside. These were used to allow archer or gunnery fire. This type of opening was flared inwards, thus the embrasure was very narrow on the outer side but broad inside, so that the archers had freedom of movement and sighting, and of their assailants, who had the greatest difficulty in seeing the defenders. A curved shaft built directly into a wall. It is like any other column, but it is physically connected to the wall, being a part of it. An engaged column is load-bearing, helping to hold the ceiling as well as providing support buttressing to its surrounding wall. Literally, flaming. This refers to the way flamboyant shapes in church and cathedral windows often are reminiscent of flames. As gothic architecture developed, there was less satisfaction with the great gains in size of window alone. The result was the development of the Flamboyant window and its greater complexity, as can be seen in the south rose window at Amiens. Until very recently, the roofs of the great cathedrals were framed in massive and complex structures of wood, often known as ‘the forest’. Due to its vulnerability to fire, the‘forest’ has been a great bane for gothic cathedrals from the earliest times. This regularly caused much damage to the cathedral at large, by damaging the stone work, as well as setting fire to the cathedral structure and furnishings. Now, restoration is turning to reinforced concrete for roof framing as, for instance, at Noyon. Iron and steel has also been used on occasion in the past (see Chartres - roof space: le charpente de fer). A church built with sufficient reinforcement and size that it can provide shelter to the town or bastide’s population in times of trouble. See also Beaumont-du-Périgord. Another name for a tribune. A purposeful decoration of a rainwater sprout projecting from a gutter take the water away from the building, usually in the form of a fantastic or grotesque figure. In the Middle Ages, gargoyles were utilitarian. In the 19th century, the French architect who restored (some may say over-restored) many public buildings in France, Eugene Viollet Le-Duc added the ‘gargoyles’ to Notre Dame de Paris in a fanciful, romantic notion, more akin to Disneyland than reality. And this is what a gargoyle looks like from above. Note that the rain runs into the beastie’s head to spurt from its mouth, so projecting the water away from the building. Etymology: The word ‘gargoyle’ comes from Old French gargurl or gargolle, meaning ‘throat’, or ‘gullet’, or even ‘gutter’. ‘Gargle’ has a similar etymological origin - the root gar-, ‘to swallow’. A funerary sculpture of Christian art depicting a recumbent person (as opposed to a praying or supplicant position) generally on the back, alive or dead with a blissful or smiling appearance (as opposed to being 'chilled to the bone'). The image is usually placed on top of a cenotaph or, more rarely, a sarcophagus. When it exists, the gisant is the main element of decoration for a tomb or funerary niche. By extension, a carved or engraved gisant in bas- or half-relief on a tombstone can also represent the effigy of a great personage or noble. Etymology: Gisant is the present participle of the verb gésir [Fr.] : lying down, lying (usually sick or dead). The same verb is used in the phrase "ci-gît" ("here lies"). Gésir is a defective verb that is only used in the present, the imperfect, and the present participle. Almost monochrome glass, each piece shaped as a square or diamond and painted with black enamel paint. From a distance, grisaille windows have an overall greyish tint; hence the name grisaille, meaning greyness in French. A grotesque is a fanciful statue, created in the 19th century or later, placed high on an cathedral or church. Unlike a gargoyle, a grotesque does not direct rainwater away from the building, it is merely decorative. Light spilling from one section of glass to another. However, these old craftsmen knew their trade, thus thickening the leading where this is most likely to occur. They even could take foreshortening into account, as you stare up at human figures placed on high. Slab, or row of stones, above a column capital at the point of the spring of an arch. The arch rests on the impost. Inner curve of an arch. A tree of Jesse is a tradition in stained glass windows, giving a visual representation of the genealogy of Jesus. The name ‘Jesse Tree’ comes from the Book of Isaiah 11:1, where Jesus is described as a shoot coming up from the ‘loins’ of Jesse, the father of David. As with most story windows, a Jesse window is read from base to top. Full lineages of Jesus as used in Jesse trees. The links in the key below go to the relevant glossary entries. The cathedral is Notre Dame de Saint-Denis, Paris. See also labelled capital diagram. The top, central stone of an arch is called the keystone. It is the last stone put in place, locking the other stones in position. According to Viollet Le-Duc, clef (in English, key) when applied to masonry, means the central arch stone that closes an arch, positioned on the vertical line from the top centre of this arch. For rounded [Roman] arches, there is a single, central keystone. The Roman/rounded arch also has other arch stones, and at its base on each side there is a springer, (E on the labelled photo above). For pointed [Gothic] arches, the arch's apex meets at a joint between the two highest stones. In these cases, in fact, the keystone is two half keystones, which can also be regarded as arch stones, one each side of the joint at the arch's apex. A pointed/Gothic arch is shaped from two part circles, and is composed only of springers and arch stones. It is probable that if a Gothic arch keystone is made of only one stone, it would probably shatter from the pressures involved. "What is the difference, it may be asked, between a maze and a labyrinth? The answer is, little or none. Some writers seem to prefer to apply the word "maze" to hedge-mazes only, using the word "labyrinth" to denote the structures described by the writers of antiquity, or as a general term for any confusing arrangement of paths. Others, again, show a tendency to restrict the application of the term "maze" to cases in which the idea of a puzzle is involved. It would certainly seem somewhat inappropriate to talk of "the Cretan Maze" or "the Hampton Court Labyrinth," but, generally speaking, we may use the words interchangeably, regarding "maze" as merely the northern equivalent of the classic "labyrinth." Both words have come to signify a complex path of some kind, but when we press for a closer definition we encounter difficulties." A 'simply connected' maze has just one path that leads from its entrance at the exterior, that winds its way to eventually reach the centre, as can be seen at Amiens, Reims. A simply connected maze may include dead ends, though this is not so at Amiens or Reims. A maze or labyrinth with dead ends can be solved - finding one's way to the centre or out again - by keeping a hand touching one wall while going along the paths. Eventually, the goal will be reached. The labyrinth at Knossos in Crete was said to be of this type. A 'multiply connected' maze has walls which are detached one from another, making separate closed circuits. The hedge maze at Hampton Court in England is a well-known example. Such a maze requires a more complex set of rules to reach the centre, or exit. These were determined by Pierre Charles Trémaux [active in the late 1800s]. Mark on the right continuously any path you take. At a junction, continue to mark, taking any path you wish. If you encounter a previously marked (old) path or a dead end, turn around and continue marking back the way you came. If when walking on an old path (marked on the left), you arrive at a previously marked juncture, take and mark any new path if available, if not take an old path. Never take a path marked on both sides. Note that Trémaux only proposes making a mark at the start or end of a path, but making a continuous line could be more obvious and reliable. Pointed, as seen in the arches and windows with a pointed head introduced in the Gothic period of architecture. [Etymology: From the point of a lance - a spear.] Also see Ogive. Where the nave and transepts cross, that crossing can be surmounted by a dome or a tower, straddling the four corner pillars of the crossing. If the tower has glassed openings that let in light down to the floor of the crossing, it is called a lantern or lantern tower. • domed lantern, also called a cupola - as at Burgos in Spain. Horizontal stone bar supporting a tympanum. Also the structural support above a door or a window. Openings in floors that project beyond the castle wall. Missiles can be dropped on unwanted visitors below. Boiling oil was not used - oil was an expensive product, and heating it would use wood in short supply in a siege situation. Machicolations are found on fortified churches such as that at Beaumont-du-Périgord. In stained glass, a medallion refers variously to a circular; oval, square or diamond shaped space, a section in a window, generally one of many within the overall window design, that contains a figure or figures. Yoked medallions are two medallions partially joined together. A meurtrière is the generic name for arrow-slit or loophole. They can be further divided into archières, cannonières and archière-cannonière. A little ledge on which priests and monks could rest their bottom while appearing to be standing, they not being allowed to sit in “the presence of the Lord” and ceremonies could continue for hours on end. These ledges are called misericords (also spelt misericorde, misercord = mercy, Fr. ), and were justified by being the location for fancy carving on religious topics or stories from the bible. In the long past, many village churches in Les Landes were built on higher points, including the artificial heights of a major heaping of mud, rocks, and stones called a motte. Sharp, hairpin-like folds in clothes, seen in stained glass windows and statues. The vertical stone bars that divide the lights (sections) in larger windows. A vestibule, found in some earlier churches. This is usually archaic now. In the early church, there was a split between the Catechumens, that is the unbaptised faithful, and the Initiates. Thus, baptisms were held in the narthex, before entry into the church proper to be with the baptised faithful. On occasion, the narthex would be a colonnaded porch in front of the main church. Sometimes, this was called a 'galilee'. In England, such entry porches can still be seen at Durham, Ely, and Lincoln cathedrals. Thus, the Catechumen would attend the first part of the service and then leave. After prayer and sermons would come the communion and the creed for the Initiates. The Church was almost in two parts, some even call it two Churches. As the Church grew in size, it gradually merged and became the enormous cathedrals and churches coping with the increasing populations. However, the choir and the nave remained as a distinction between priests and people. This was adjusted quite recently, as Vatican II changed services to the vernacular and turned the altar so the priest faced the people. Another purpose of the narthex, remembering that British cathedrals were mostly monastic foundations, was where the monks could meet with local dignitaries ('civilians') or females. Main body of a church or cathedral. From the french word for a ship, the nave looking similar to frame of an upturned ship. The spaces enclosed by the framework of ribs supporting vaulted ceilings. The net is the web of stone between the arches of the vaults. These continuously curved shapes, like a spider’s web or an eggshell, have both redundancy and surprising strength. (If a spider’s web or an eggshell is broken, the main structure remains functional.) I am told that the web at Notre Dame de Paris is only about 6 inches thick, yet it has held up for 800 years. In the photograph below, you can see the web at Reims cathedral pierced by a German shell in 1915. See also Spoila. For much more technical detail, see Sexpartite vaulting. This term is used widely and confusedly in several areas of language, including in statistics, as well as in architecture. 'Ogive' is used to label/describe a slope that changes direction, as in the letter S, or in a hyperbola. Thus, in architecture, 'ogive' is sometimes used of ribbed vaults or the cross-section of re-entrant (s-shaped) mouldings. Etymology: Said to have been used by Villard de Honnicourt, 13th century; probably from auge, French for trough, possibly coming from Latin alveus. It is conventional to refer to the apse end of cathedrals as the east, and the other three points as west, south and north. It is also common to refer the the ‘east’ end of the cathedral as being oriented towards Jerusalem. In fact, many of the cathedrals were built on sites which had long been the place of previous cathedrals. These had often been burnt or otherwise damaged, or overtaken by changing fashions and growing congregations. And going beyond that into the past, they were sites of Roman and pagan temples. The demands of site and geography could also be a consideration. Thus, if you check, you will often find that cathedrals are not reliably oriented east-west, but their orientation is quite variable. The magnetic compass was only being introduced in Europe in the late 12th century, by which time the sites of most cathedrals were well established. So maybe the cathedral builders had used the North Star. However, the convention remains. The main altar/apse is at the ‘eastern’ end, the prime public entrance is at the ‘west’, with side entrances at ‘north’ and ‘south’. The nave-transept crossing is essentially a large, wall-less, square room. Adding an circular or octagonal drum or lantern, or a hemispherical dome, above it, requires a three-dimensional solution to join the two parts together and provide adequate support for the superstructure. shallow, rectangular pillar attached to a wall. A pilaster is not load-bearing, it is a decorative addition to a wall. On the other hand, an engaged column is a curved shaft built directly into a wall. It is like any other column, but it is physically connected to the wall, being a part of it. An engaged column is load-bearing, helping to hold the ceiling as well as providing support buttressing to its surrounding wall. Here, I am following the definitions and descriptions of Viollet Le-Duc. I shall treat columns and pillars as not being the same thing, in that I take pillars to be composite and part of the Gothic structural innovation. All of these are upright posts of various heights, thicknesses, and so of differing substance. Then you can also read of posts, struts and stanchions! Here we will look only at pillars made of stone. • Pillar - a large, vertical post or similar tall structure, often used for supporting a building or parts of it. • Column - An upright pillar, usually a cylinder, designed usually to support a larger structure or part of a building above it, such as a roof or horizontal beam, but sometimes used for decoration. • Pier - one of the pillars supporting a bridge or arch, a rectangular pillar or similar structure that supports an arch, wall or roof, a large column, or a squat or short one. Because columns are of relatively small diameter, they are only capable of supporting limited vertical down force and unable to support much oblique load, like those generated by arches or vaulting. Composite or compound pillars have one part that rises and supports a lower arch, while another part continues higher to, say, support an arch or some vaulting. A pillar is made up of a principle support, with several subsidiary shafts and half-columns (or responds). In the photograph below, the various component pillars are coloured to show which higher parts of the cathedral's structure are being supported. Only one compound pillar has been marked (to the left of centre, with two purple lines enclosing a blue line). You can follow similar paths on other pillars to see how they contribute to this support of the cathedral's ceiling. cyan: supporting transept main vaulting. The part of a portal that extends outwards beyond the cathedral portal, its extrados. The archivolts of the porch are supported by statuary and a lintel. The ensemble of a cathedral door, its surrounding statuary, lintel, typanum and archivaults. See image just above [Porch.]. When a bishop (or archbishop) held one or more secular titles concurrently with their religious office, their title was prince-bishop and their religious domain was called a prince-bishopric. As well as being a bishop or archbishop, they may have been a prince (or other powerful person, like a duke) of a local secular territory (which for a prince was called a principality). The secular territory may be coincident partially or totally with their diocesan jurisdiction. a vaulted ceiling with four ribs. For much more technical detail, see Sexpartite vaulting. Here, the glass is constructed as rays spreading out from the window's centre. In the example above, the rays mimic lancet windows. Such windows can be seen in the south rose at Laon, the south rose at Rouen cathedral, and also the north rose of Ouen Abbey Church in Rouen. There are many, confusing definitions of a retable, some of which make an apparent separation of whether or not the backdrop to a church's main altar is attached to the altar. According to more recent, probably English, church historians, a reredos is a decorative screen above and behind the high altar, but structurally separate from it. However, it is unclear as to whether there is, in fact, any actual difference between this and a retable. Certainly, Viollet Le-Duc's Dictionnaire only has an entry for the retable. Ribs are primarily weight-bearing, curved columns of piped masonry, the armature [framework] of vaulting. However, particularly in England, where the perpendicular style developed, ceilings became far more decorative and complex. Ribs tend to be categorised with various labels including tierceron (in-between rib), lierne ( linking rib), longitudinal, traverse, diagonal. Very fancy ceilings (decoration) are often referred to as fan vaulting - variations of cones. This part of the cathedral or church you will often hear called the roof, but it is not the roof, it is a ceiling. The joins between various ribs were usually covered by bosses of various artistic merit and complexity. Such bosses can be seen in Norwich, Exeter, Ely, Winchester, Hereford, King's College Chapel Cambridge, Gloucester, and many other cathedrals. Even fancier pendant vaulting can be seen at Canterbury and at Westminster. The bosses were, in part, used to cover the joins between ribs, but also developed as an art form. These bosses have lasted rather better than much English church art, as the vandals of Henry VIII and Cromwell were less able to get at them. In Norwich, there are over 150 bosses, often highly coloured. Also known as choir screen, chancel screen, or jube (un jubé). An ornate stone or wood partition dividing the nave from the choir. Small room, usually leading from the east end of a church, used by the priest to don his ceremonial vestments and prepare for a service. Also used from counting up moneys donated. Imitated in in current times, this room of last resort was constructed under the eaves, close to the military walkway on high. Safe rooms are often marked by openings in the church wall close under the roof's eaves. [An imperial (long) ton is 2,240 lb or 1,016.05 kg. A short or American ton is 2,000 lb or 907.18 kg. Comparing one Bourges sexpartite with two quadrapartites, a Bourges sexpartite covers an area of about 92.2% of two Cologne quadrapartites. Thus, 400 tons at Bourges matches to about (300 tons x 2 x 92.2%), that is 553 tons. You can see from the figures that the sexpartite formation is more efficient in supporting and spreading the load than the quadrapartite configuration [Abstracted from Mark, p.117, note 15]. The vaults also have rubble, or fill, to increase pressure and to help stabilise them. This included in the weights quoted. Mark estimates that the horizontal outward thrust on the main piers as 28,100 kg (62,000 lb) at Bourges, and 31,300 kg (69,000 lb) at Cologne. The secondary, lighter pier at Bourges, Mark estimates at 11,300 kg (25,000 lb). These can sometimes be double. The space between four pillars is called a bay or a transverse section. The vaulting goes diagonally across between the piers of each bay. The socle is the first row of stones above the base, in a wall, or a pillar, or a column. The base always provides emphasis to the projection just above, a more or less pronounced thickening or broadening - the socle. In the constructions of the Middle Ages,the profile of the projecting socle was never left horizontal. In Romanesque architecture, the profile that crowns the socle is usually a bevel 45º to 60º. Later, during the Gothic period, the profile of the socle was often a moulding (bead) carved so as not to present sharp edges that could injure passers-by. There is no need to say that for socles, the builders of the Middle Ages have chosen the toughest materials. stone carving on which a statue stands, such as a lion, donkey, angel, book. Etymology: French; from Latin socculus, probable diminutive of soccus - a sort of shoe or slipper (related English word, sock). Also possibly Italian zoccolo - wooden shoe". Triangular-shaped area of stone between two arches that are in a row. Below, the spandrels are highlighted in pink. Spandrels may be decorated with diapers, as in this illustration. Part of the south transept at Westminster Abbey, England, showing spandrels with diaper decoration. Reused old glass is also sometimes referred to as spolia. Occasionally, you will see terms like"springing from" and "springer". They all refer to where the arch arises from a pillar. In particular, the first stone is called the springer. The top, central stone of an arch is called the keystone. The top stone of a pillar is called the capital. Springers are the first, the lowest, stones of a vault rib or arch above the springing point (the level at which a vault or arch rises from its supports, such as pillars). In Gothic vaulting, it is the lowest stone of a diagonal or traverse rib. Stained glass window which tells a story, from the Old or New Testament of the Bible, or the life of a saint. abelard.org has made a detailed analysis of the story window of Saint Julian the hospitaller in Rouen cathedral. The talus, a sloped portion at the base of a fortified wall, provided an effective defence in several measures. • Conventional siege equipment was less efficient against a wall with a talus. • Scaling ladders may be unable to reach the top of the walls and the ladders were more easily broken because the large angle of slope caused bending stresses. • A Siege tower could not approach closer than the base of the talus, with its gang plank often unable to reach across the horizontal span of the talus, making them useless. • Defenders could drop rocks over the walls, shattering on the talus and spraying stone shrapnel at attackers at the base of the wall. Colossal male figures used as columns. A ring, often like an inflated inner tyre or a doughnut. Going across the main body of the cathedral, with north and south arms, sometimes with side doors. See cathedral plan. a strengthening crossbar, in windows or above a door. Tracery is a decorative method of providing the stone framework, and so the support needed, in windows of great spans. 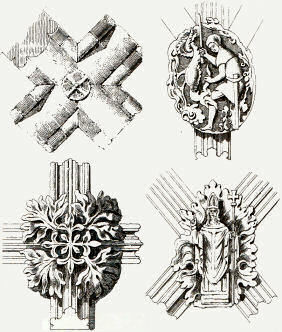 Tracery can also be found in rose windows Stone tracery is also a common form of decoration in towers, as chapel dividers, and even garden walls, where glass is not inserted. Similar patterning appears with other materials, such as wood. See also Stone tracery in church and cathedral construction. Supporting arch which goes across a longitudinal vault, from one side to the other, and so divides the bays in a side aisle. A traverse arch usually projects out and downwards from the surface of the vault. A tribune is a much wider area than a triforium, extending across the width of the aisle below. The tribune is more like a room, lit by windows to the outside. Also known as a gallery. The word triforium has no reliable etymology, but has come to mean the arcaded gallery below the clerestory windows and above the nave aisles and side bays. More effectively, I would use triforium as describing a minor gallery somewhere above the nave aisle level. This word was first used by Gervase of Canterbury, c. 1185, to refer to a gallery at Canterbury Cathedral, and was used only in the context of Canterbury Cathedral until about 1800. There are one or two glazed triforia, for example at Tours and at Saint-Denis, Paris, the latter being often regarded as the first of the true Gothic structures. A pillar statue, for example between doorways. See Noyon cathedral. the half-moon shaped space above the exterior doors of a cathedral, shaded by the archivaults above. The tympanum often illustrates events in the life of Christians, or events in the Bible or in the life of a saint. A Latin word, the plural is tympani. Literally, a bladder. In stained glass, an ovoid shape with pointed end. Sometimes referred to as almond-shaped. A vesica can be constructed from two intersecting circles with the same radius. An arch is built of voissoirs, or stones shaped like wedges. The voussoir at the top and centre of the arch is the keystone. A spiral scroll, usually part of the decoration on a capital. Dictionnaire raisonné de l'architecture française du XIe au XVIe siècle by Eugène Viollet Le-Duc. abelard.org regards Viollet Le-Duc as definitive for architectural terms. Definitions from other sources are often inconsistent. Triforia is the plural of the Latin word triforium. In Latin, words that end in -um are most often neuter words in the Second Declension, and decline (change) to -a in the plural. So - one triforium, several triforia. Composite is often used to describe an object made by combining two different materials, such as steel and cement, or two different grades of material. Composite is also used to describe a particular type of capital to a column that combines elements of the Corinthian and Ionic-style capitals.